It was the last day of our 3 day Ipoh foodie trip and I suggested that we could try an old school family type restaurant after eating so much street food and kopitiam food. 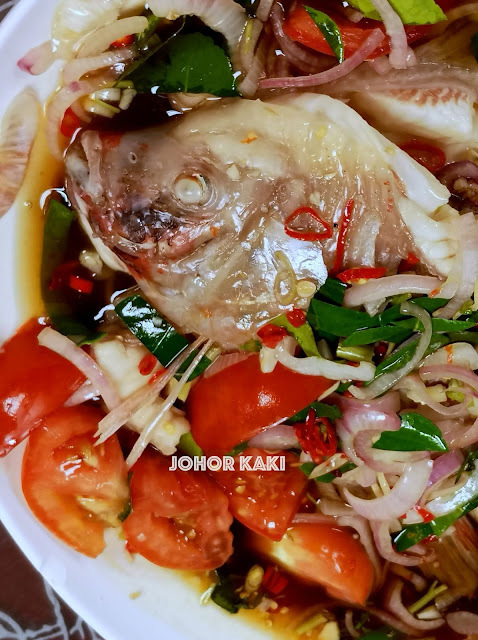 Our Ipoh buddy Gilbert dialled a few of his favourites but it was full house everywhere. He finally found an available table at Sun Marpoh 孖宝海鲜饭店 which we quickly grabbed without much ado. We were glad we grabbed the booking as the two shop lot restaurant was packed to the rafters when we arrived. 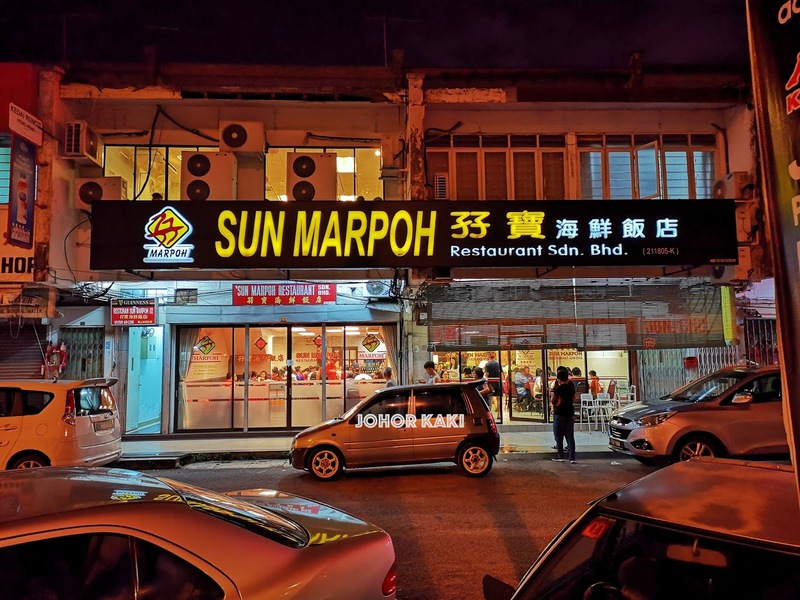 Restoran Sun Marpoh 孖宝海鲜饭店 has been around for nearly 30 years and is a household name in Ipoh. 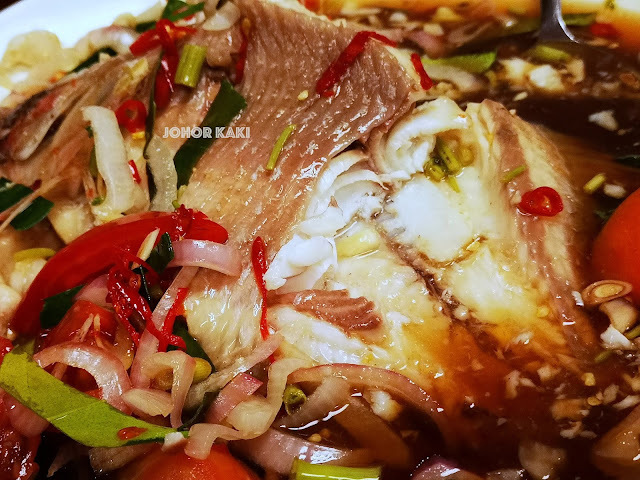 三味蒸金凤 Trio-taste steamed tilapia - a large pink tilapia steamed, drenched in a pool of sourish sweet savoury spicy sauce and smothered in a heap of chopped tomato, raw onion, spring onion, raw garlic, cut chili pepper etc. 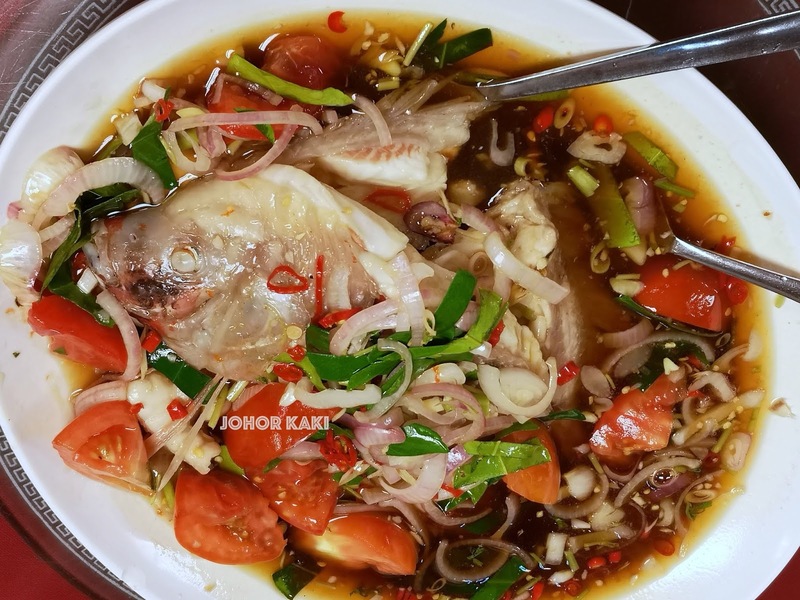 The fish was meaty, tender and sweet with underlying earthiness well masked by robust sour, sweet savoury and sharp spiciness from the pool of sloshy sauce and raw vegetable toppings. 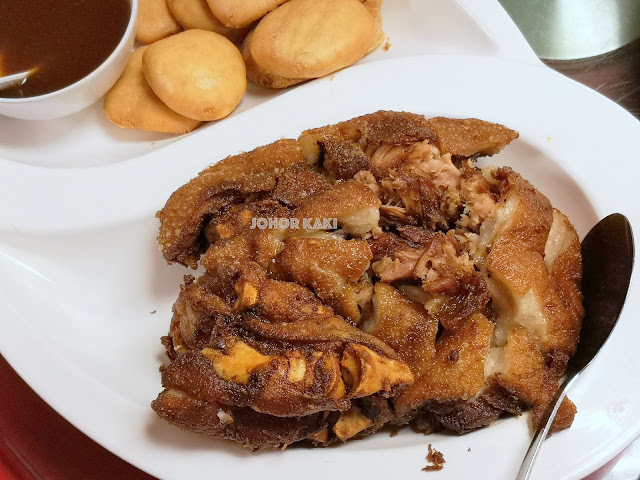 香酥猪手 Crispy pork knuckle with fried buns and brown sauce. 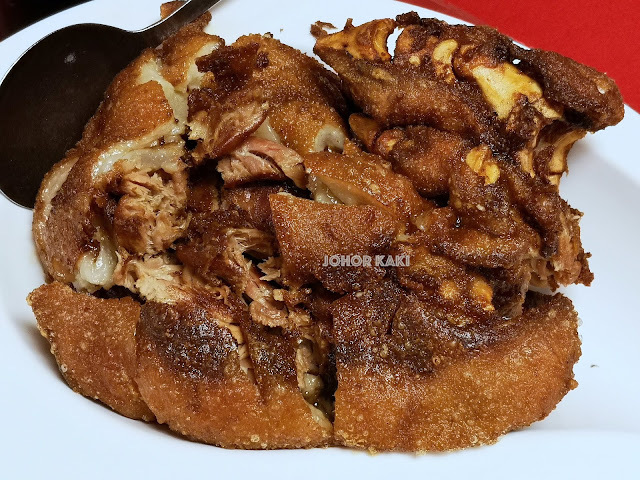 Large pork knuckle seasoned with salty savoury spices well deep fried till the browned outside was crackly crisp while the fat and meat inside were still tender and moist. 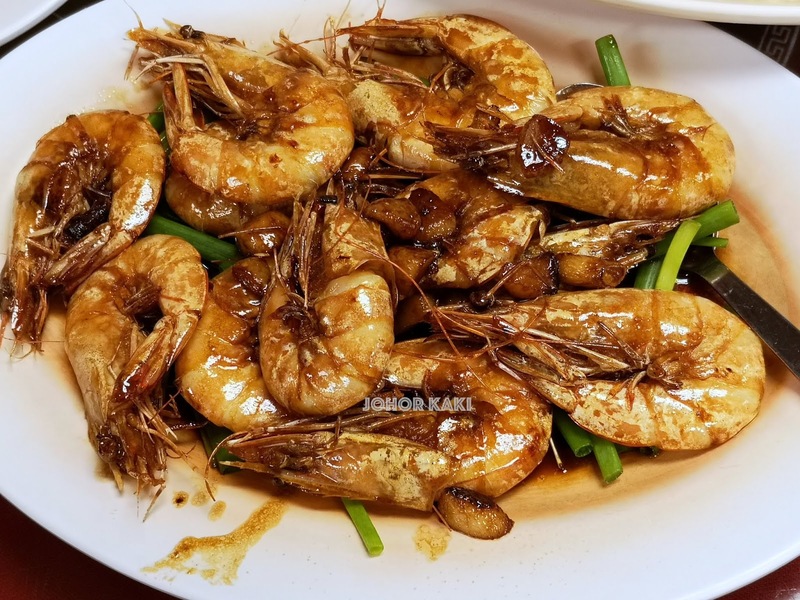 干煎虾碌 Har Lok - large fresh prawns fried with savoury sweet soy sauce blend and garlic cloves. 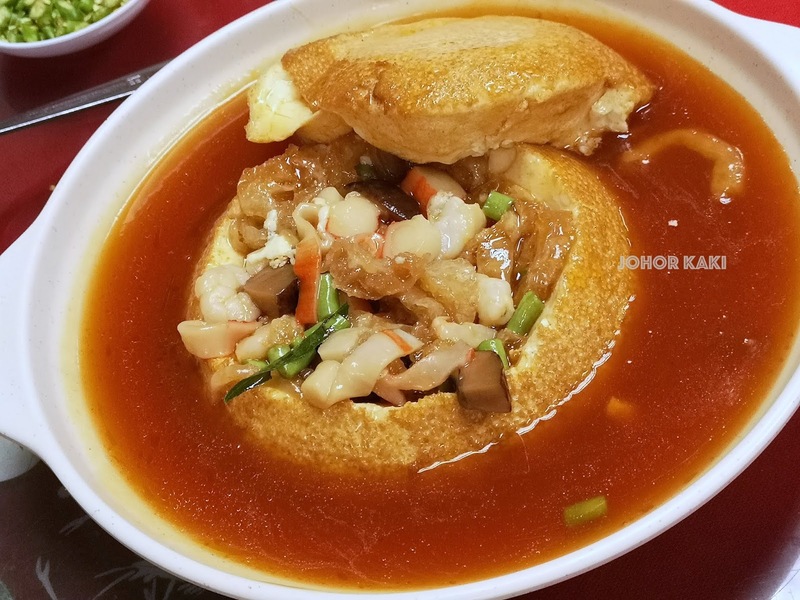 金屋藏宝 Treasure pot tofu - hollowed out fresh house made tofu with soft rough skin outside and soft tofu inside. 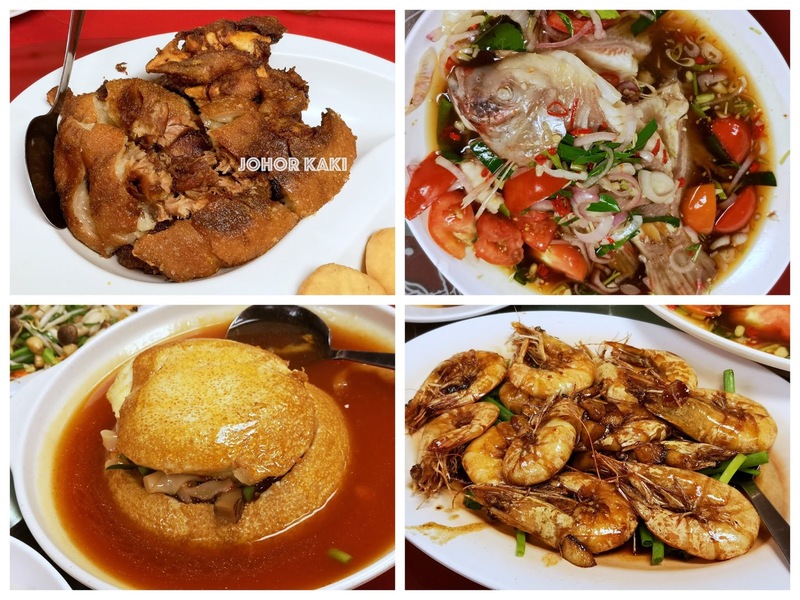 The tofu was packed with stewed "treasures" such as mushroom, crab stick, fried pork skin, prawn, French beans etc. Served with starch thickened savoury sweet brown stock. Mixed vegetables with green dragon greens, bean sprout, mushroom, julienned carrot etc stir fried in soy sauce blend. 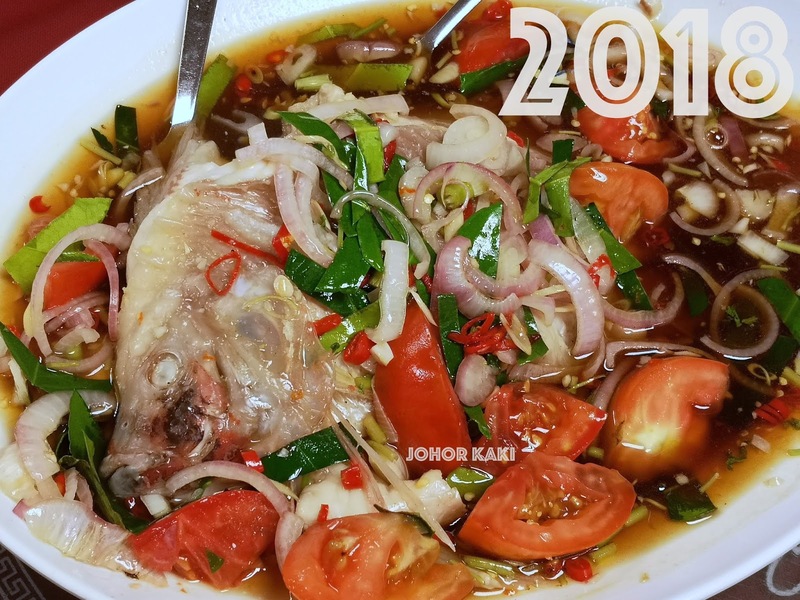 Information for you 👍 From the few dishes we tried, the ingredients were fresh, and the dishes well executed. 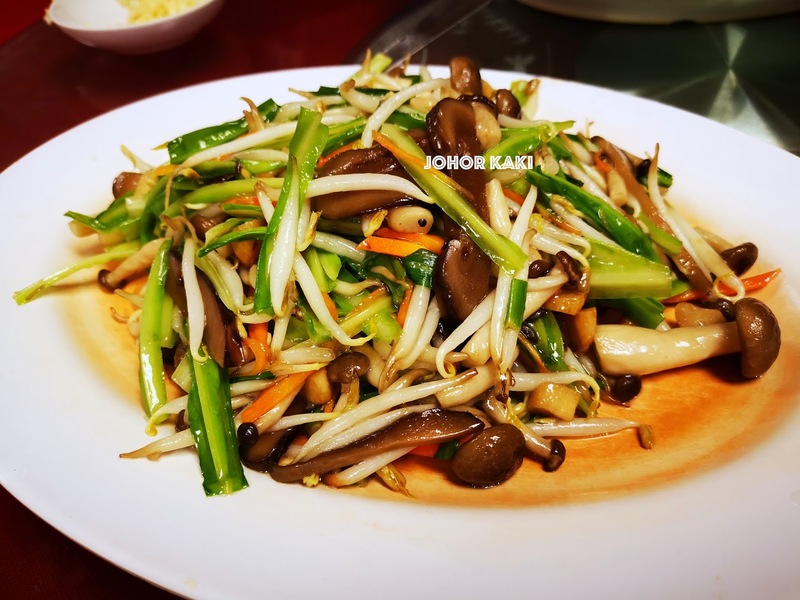 The flavours were on the robust assertive side, making them very appetising with plain white rice. 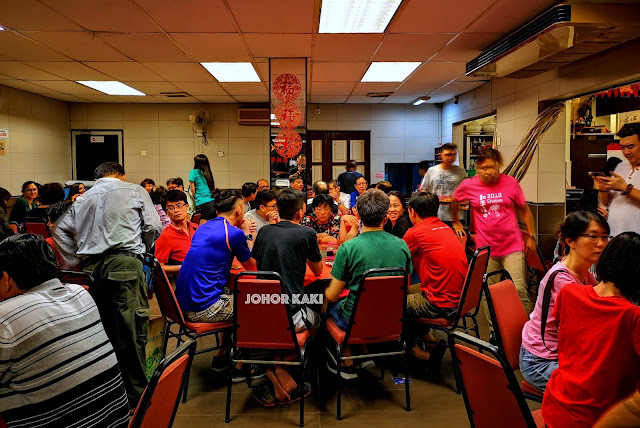 Prices were reasonable and the atmosphere was full of buzz as expected of informal family dining places in Malaysia. 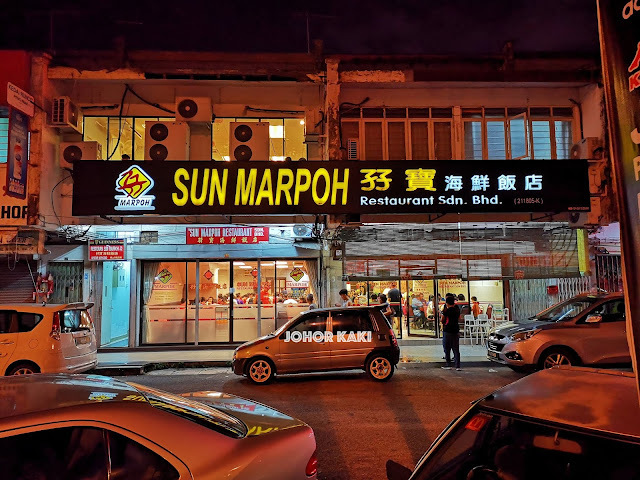 There are many more dishes I would love to try at Sun Marpoh. 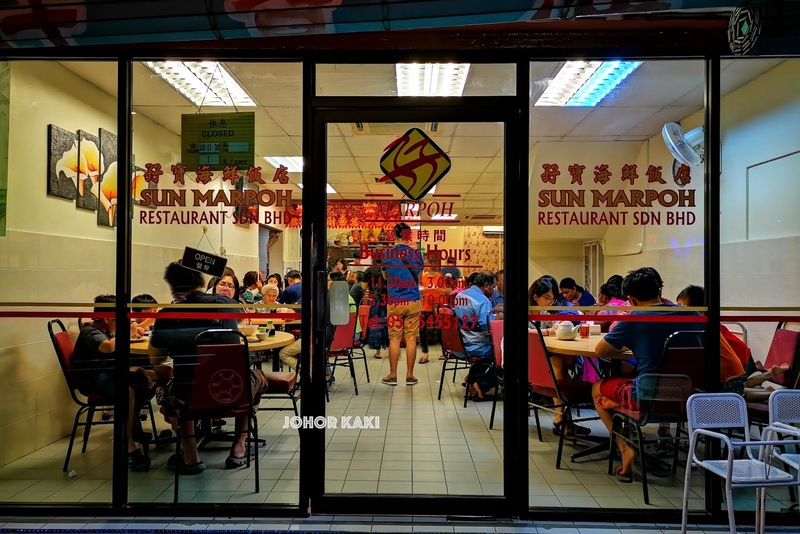 Next visit, we shall try Sun Marpoh's 印尼虾煲 Indonesian style prawn in claypot, 招牌吊片 Fried Cuttlefish.